This would be hard to make up but unfortunately it is true. The folks at EPISD either forgot about a school or they want to slip one into the bond issue. 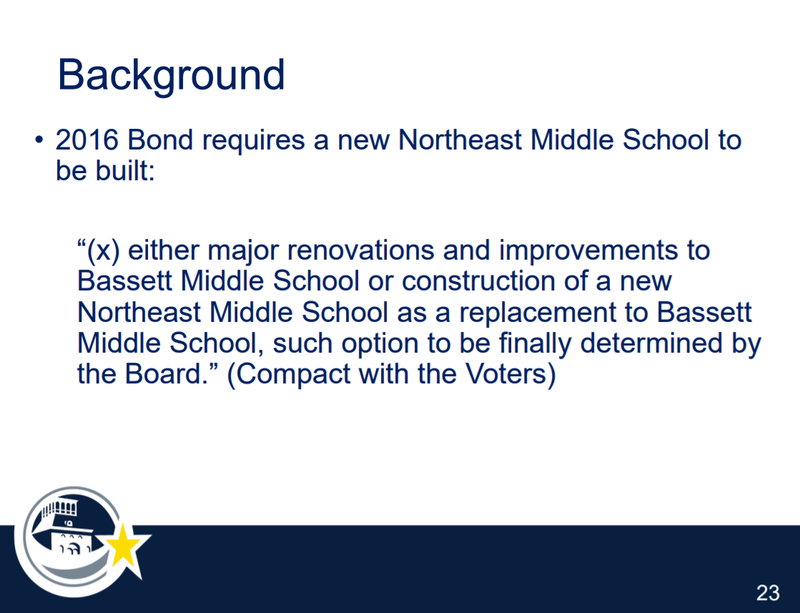 The bond issue as passed allowed them to either build a new school to replace Basset middle or spend money to renovate it. They have chosen to build a new school up the road on military property. Well now they are telling us that they forgot about Armendariz (the “Young Woman’s Academy”). Now they are telling us that it should not be a separate facility just for women but should be combined with the kids from Basset. If they do this won’t they be combining a high school with a middle school? Also won’t they end up with an all female high school on a coed middle school campus? 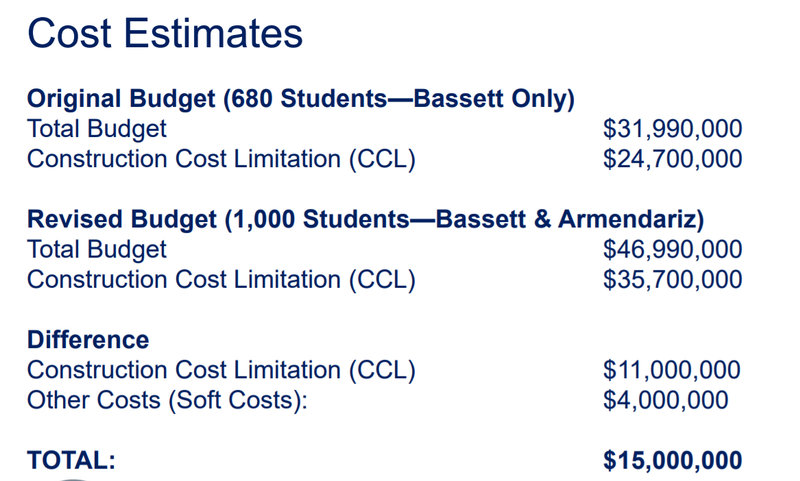 It would appear that they are planning to use half of their construction contingency budget to make the changes. The extra bill is projected to come to $15 million. “Compact with the voters” my foot. This entry was posted on Wednesday, August 8th, 2018 at 5:00 AM and is filed under El Paso Independent School District. You can follow any responses to this entry through the RSS 2.0 feed. You can leave a response, or trackback from your own site. The almost BILLION$$$ Bond was never anything but a slush fund for the Board, Cabrera to blow-off as they want. The MILLIONS$$$ THEY take from US is never for any specific purpose. Mostly it’s for THEM to keep Cabrera in the “Life-style” in which THEY have made him accustomed. When have THEY, do THEY make any “Accounting” to US?? Anonymous, posts such as this serve no purpose. Of course, the bond issue was not a slush fund for Cabrera. It was spelled out completely what the money was to be used for. Of course, its use was not really needed but the voters felt differently so we are stuck with it. If any government auditing agency ever checked the election, I am sure they would find out that election laws were broken. However, Cabrera now sits on 4.5 more years of the highest Superintendent salary in Texas and if this board thinks they can control him they are nuts! My guess is what got this bond passed was teachers, school employees, contractors and their families voting yes based on promises of job security/raises or new business. I know I voted no and most of my homeowning friends felt the same way. The biggest problem we have is that the public sector is our largest employer. When a bunch of public sector employees turn out to vote for a bond issue and most other folks stay home, we end up in more debt. Our leadership understands this. If you can call it leadership. EPISD was bracing for today’s results going out to the public. They funneled millions into making this joke of a single gender program. Gave them the best that money could buy, entirely neglected Armendariz and Bassett to provide for the single gender school the be successful. To show for all that Bassett come off the improvement needed tag and Armendariz grew to a grade of 77 with 2 state distinctions. In comparison the 12:1 student teacher ratio and all the bells and whistles at the young Women’s academy yielded a grade of 82 with just 2 distinctions while having negative student progress (students got a lower test score than they had the prior year). Only 8% made appropriate progress. By comparison YISD Women’s academy had a grade of 96 with 7 distinctions. EPISD now realized that this costly experiment was not worth the money or effort. They threw a principal with zero years of administrative experience to lead a school. Talk about set for failure. They are trying to cut their losses and combine all 3 schools. EPISD knew this last week, the public did not. And the ride continues, yee haw. Voters and taxpayers are definitely being compacted. So they can’t use a school building proerty they are closing??????? OK enlighten me, a poor retired teacher. I thought Women’s academy would start out as 7th and 8th then morph into HS. That changed. Bond election run ups were done in 2015-2016 and YWAA wasn’t approved until after Bond Election. Tearing down Bassett and building a new school was in the cards because of the value of the land Bassett sits on. So now they feel they need to add on to the 2016 Bond the YWA as another HS? Isn’t that out of scope of the Bond? I expected them to use Wainwright or the old Magoffin, but have a middle and HS together? 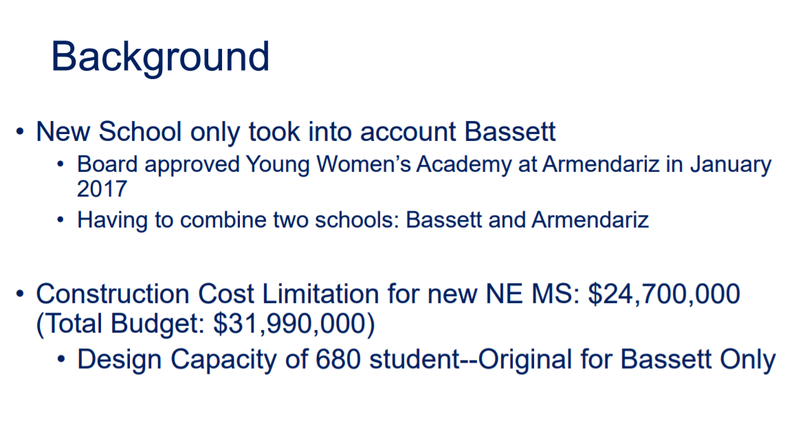 That’s why they were combining elementary and MS campuses, to avoid combining MS and HS. Supposedly. For that matter why not use CCTE since it’s half empty most of the time. Since the YWA was a total mess with accountability ratings (they performed mediocre getting and 82 and 2 distinctions). EPISD will go back to the drawing board. No one can explain how funneling the top girls (similar to what Silva Magnet does) in the district, paying close to 1 million dollars to New Tech networks, remodeling the facility and giving them a 15:1 teacher ratio just was not enough for YTA to be anymore than mediocre therefore a new plan will be in place soon. exert force on (something) to make it more dense; compress. Until they crush us under their tax burden.